The Kalash are a culture where their festivals form a central point of their lives. While during the harsh winter there is very little reason to celebrate, once the spring comes in the valleys, people are greeting the new season in a massive celebration. This is the yearly Joshi Festival that occurs at the end of each May. Milk plays an important role during this festival. But not just any milk, but milk that was saved ten days prior for this very special occasion. Kalash people use this milk to purify newborns and houses. Newborns are fed the milks, but it is thrown on houses and objects as well. At the end of the festival, leaves are thrown on participants’ heads to show the arrival of the spring. 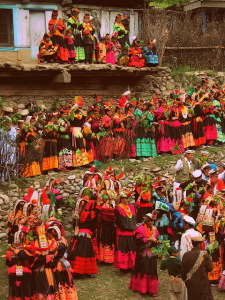 Another festival of the Kalash is the Uchau and it is celebrated every autumn. But the most important of all festivals is the Chawmos, celebrated in the middle of the harsh winter, in the month of December. This festival marks and celebrates the end of the harvest and during this time, the animals are sacrificed to provide food source for the winter. 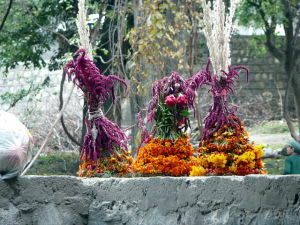 Although it is the biggest festival of the Kalash, it is also less popular among tourists given it takes place in December. Also, impure persons are not admitted to the celebrations without purifying themselves beforehand. The purifying ritual consists of fire and of brands of juniper being waved above the uninitiated’s head.